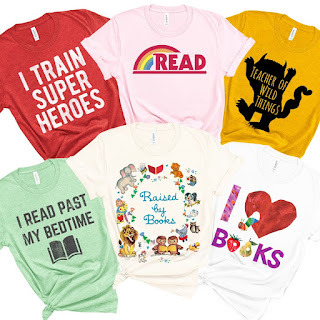 Check out these Celebrate Reading and Teachers Soft Tees on sale for $13.99 (Retail $24.95). Celebrate the love of Teaching and Children's Books with a uniquely designed soft Bella tee. We suggest ordering your normal size for a loose fit. For a more fitted look, size down. Made to order. We print each shirt with direct to garment (DTG) printing for a crisp design that won't crack or peel. Shirts are soft Bella and Canvas UNISEX Fashion Fit tees that fit like a well-loved favorite, featuring a crew neck and short sleeves.